Agile working is probably the most widely discussed ‘new’ method of working. In a nutshell, going agile is when a company becomes flexible in their approach to work. It’s when they choose to trust their employees instead of keeping them on a strict schedule. It explores the idea that nobody should spend their whole day at a desk. Thus, you will never find the whole workforce of a company in the office at the same time. Five years ago, it was the work style that revolutionary companies were adopting and that the others would stand and watch in awe. Agile working has been defined as a tool organisations use to help employees work efficiently and improve productivity. By going agile, employees enjoy the flexibility to work when, how, and where they choose to. But even with the rising adoption, many still approach agile working with caution. This new trend still continues to raise eyebrows with the conservatives adopting a wait-and-see attitude. Would you as an employer allow some of your workforce to work from home or in co-working areas? How keen are you on micromanagement and what is your work culture? What are your employees’ preferences? How do you collect office occupancy data? Do you want real-time and historic insight? Don’t worry. We’ll help you answer all of these. Well start by telling you that through information technology and communication, employees work with fewer constraints and maximum flexibility. This optimises their performance since they work in ways that suit them. Work, in agile models, is an activity rather than a place. It’s aimed at making organisations efficient, effective, and more responsive. People do not need to be at the same desk all day since they can work where and when they choose. Some tasks don’t even require desks. Agile working is, however, not a one size fits all concept. Before its implementation, one needs to convince all stakeholders of its benefits. These benefits differ from organisation to organisation, of course. But some of these benefits can be found in almost all agile companies, irrespective of their size and the industry they are in. You can meet all your customers’ expectations. Business continuity is improved since disruptions due to travel problems, bad weather and security are reduced. Technology advancements have also made it possible and easy for organisations and agile workers to quickly adopt this concept. Applications such as iotspot make it possible to maintain these agile workspaces remotely. iotspot ensures that your office space is based on actual usage. It ensures that you get smart workplaces that attract the right employees, reduce waste, and significantly bring down costs. The app allows users to find and book a space that will suit their needs. Whether they want to work at a private booth, have a conference meeting with 5 of their colleagues, or get an unoccupied desk at a place of their choosing, the app makes it possible. With it, you can occupy a workspace immediately or book in advance. It makes things easier by avoiding overbooking and making sure one finds a free desk even in a busy room. 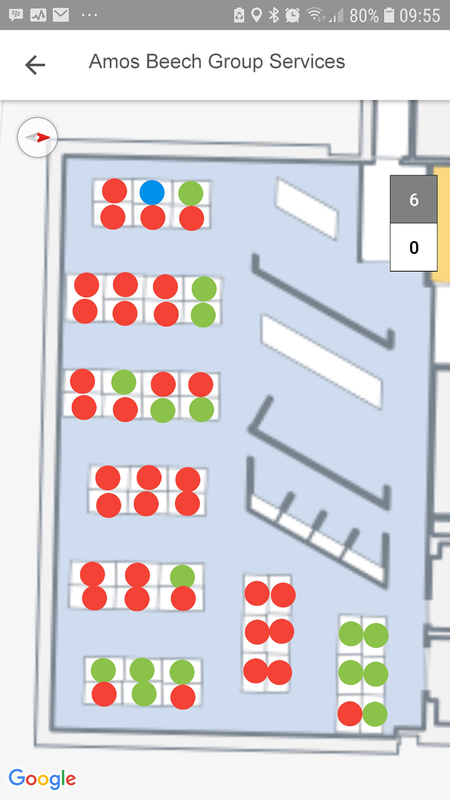 The app uses color to show if space is available (green), reserved or partly available (blue) or occupied (red). The app helps you know where colleagues are. The activity-based working environment that the app provides allows you to make your bookings to suit your needs. Colleagues are made visible and this makes co-working possible. You can search for free desks together to help you set up a workgroup, share your location with colleagues. If you want a shake-up on a Friday, let the app choose a random desk for you to allow you to network with colleagues you don’t yet know. You do not need to call the reception to make a booking. No! You can do it on the go. The app goes further and helps you navigate to your booked desk especially if you don’t know the layout of the workspace. Agile working means that people can work from wherever suits them. The app makes this flexibility a reality by offering office sharing and charge per usage options. It helps show and authorise availability of office locations across, between or within an organisation. This helps reduce commute, usage of facilities and office materials. iotspot is independent from the IT structure. Your only requirements will be a USB port that makes the workspace available in the app. With this, you get a smart building and can now invite users to get started. The app can help organisations get insights into how their workspaces are being used. One can tell what desks are popular, which ones are not, and which environment people like to hang out in. From these insights, you can tell whether the agile working model is working for your organisation and whether employees fully understand the concept and benefit from it. Data collection is done via different methods including movement sensors. These are placed under desks and meeting tables to collect actual usage data. iotspot can also be used in conjunction with counter sensors and CO2 in meeting rooms to determine what size of a meeting room an organisation needs. This data is collected anonymously and can be used to drive future workspace decisions and improve workplace environments. This then leads to a happy and productive workforce and savings on corporate and real estate. This is achieved by allowing employees to choose where they want to work from and at what time through the app. Booking in advance allows for the desks and rooms to be held for workers and if they fail to show up, they become available for someone else. Meeting bookings can also be done in advance using the app calendar, Google calendar or MS Outlook. Users who are not willing to pre-book can walk in and have the app guide them to an empty space using the Google Maps in the app. The status of the desk then changes from red to green after you check in. The on-desk device helps to give the desk status by showing whether it’s occupied or not. If you leave the desk, your app sends a message after a stipulated amount of time to confirm if you still need the desk. If you fail to confirm, the desk reverts to free automatically. The app, with all these amazing functions, helps your organisation implement agile working effortlessly. Desks become free for other people to use and office space is reduced. Integrating with this agile working app could mean a change in how organisations run their businesses. There are many ideas on how it can be used to revolutionise working spaces in the future. For example, through iotspot, you can automatically free up parking spaces typically reserved spaces for people who are not in the office. Another development is the introduction of a payment function to those running co-working spaces. With this, they can charge users per usage instead of monthly. We also see a future where as each iotspot is placed on a workstation, an FM messaging option can be developed to inform the team of any challenges at the workspace. These could include faulty lights and problems with power and screens. This would make solving issues easier since all the information about the specific defect and where it happened would be on the app. Agile working implementation should be business-led. It should address both employee and business needs. To start, find out and understand what your business and employees need. Work with your employees and learn what their ideal work environment is. If you involve them and implement agile practices that add value to them and to your business, you get a productive and loyal workforce. It’s imperative to also educate the organisation’s leadership on why you need the change and how to implement it. Having them on your side will eliminate any barriers towards the change. Your agile organisation will work better, have an engaged workforce and you will get extra value for your investment. Research shows that, on average, desk occupancy in most offices is 45-50 percent. This means that, on most days, desks are empty either due to sick leave, holidays, or leaving the office. Part-time employees, employees who often travel to meetings and conferences and those who work from home also get full-time desks that on most days remain empty. If you do a survey of your office space, you will find that there is no time it’s 100 percent occupied. Space sharing is, therefore, a good thing to consider. With agile working, you bring people, processes, space, and technology together to offer an appropriate and effective way of completing tasks. People can work without boundaries from anywhere, anytime and this improves productivity. The time to start collaborating and changing the future is now!